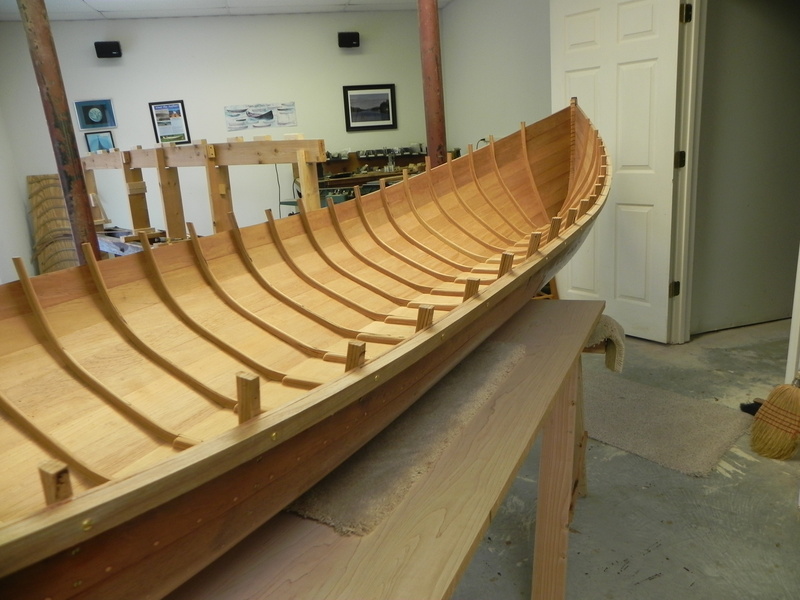 Building an Adirondack Guideboat-off the jig! That long anticipated moment finally arrives. After months of planking, a milestone is passed. The hull is now ready to come off the jig and be set right side up. Why is this such a moment of trepidation for the builder? I have been working blind as far as the other side of the hull is concerned. Sure I can scrunch down and look up under the hull to see how things are going. Or, I can take a mirror to see if planks are mating as well as I hope. But none of these stop gap measures will really tell me how the other side of the hull is shaping up. It is frustrating and I have to assume that if things look good on the side I can see then the other side is OK too. Some of the old time boat builders got around this problem of working blind by having a sort of a builder’s jig “rotisserie” whereby they could turn the hull under construction 180 degrees to view both sides of the hull. 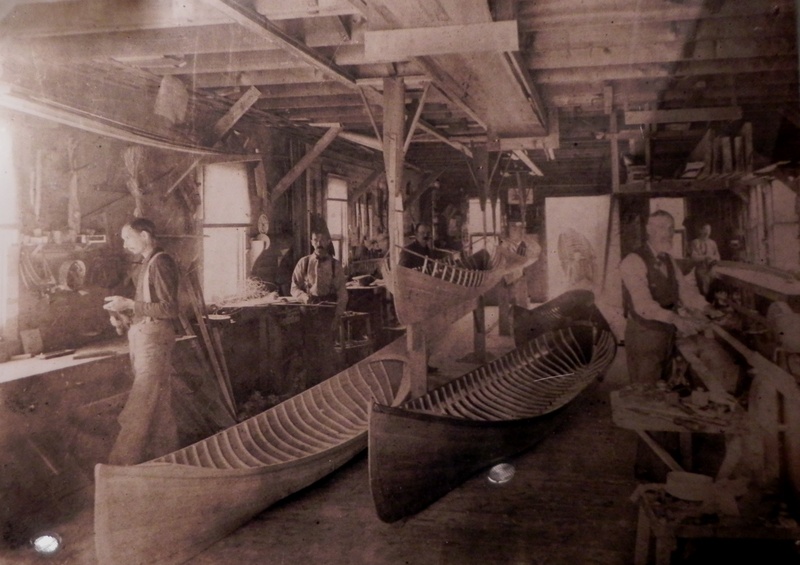 In a photo of the Parson brother’s shop one of their boats under construction is suspended on long poles from a high ceiling. It appears that these builders could pivot their hulls around the posts so that they could work on both sides while planking. It is interesting to see that at least five men were employed in the Parson’s enterprise. Each man may have been assigned a special task that best suited his talent. One may have done planking while another may have gotten out ribs. For example, the man on the left of the photo is making an oar. Faintly seen through the open door in the very rear of the shop is a man holding a guideboat in the tradition fashion via yoke on his shoulders. I found this a rather amusing sideline to the photo. A view of the Parson’s Brother’s shop taken around the turn of the century. Note the guideboat suspended from the ceiling. Well, how did the “dark side” of my hull look? I detached the hull from all the bracing and fasteners securing it to the jig. Then a friend helped me lift the hull off the jig and place it on a set of padded saw horses. I was pleased with what I saw. The plank joinery was tight with only a few spots were the planks didn’t mate exactly. Better yet, there were no gaps where the planks and ribs meet. I was quite happy with the results. Using a bathroom scale we weighed the hull. It came in at 47.8 lbs. That is just about right for a hull at this stage of construction. By the time I add the decks, the “furniture”, the oar straps, and finish the varnishing she’ll come in at the mid 50’s to 60 lbs. Below is a photo of the hull free of the jig. Hull is free of the builder’s jig, seen in the background.